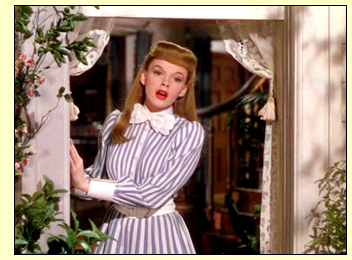 This week's love song is The Boy Next Door performed by Judy Garland in Meet Me in St. Louis (1944). The Boy Next Door is one of three classic songs that Hugh Martin and Ralph Blane wrote for MGM's all-American musical, Meet Me in St. Louis. By 1944, MGM producers Arthur Freed and Roger Edens had their own production unit, which made several musicals that were big hits for the studio. Freed and Edens decided that for their next film they would move away from the Mickey Rooney-Judy Garland backstage musicals that were the Freed unit's bread and butter. Instead, Freed, Edens and newly hired director Vincente Minnelli wanted to focus on a timeless story about life in turn-of-the-century America. 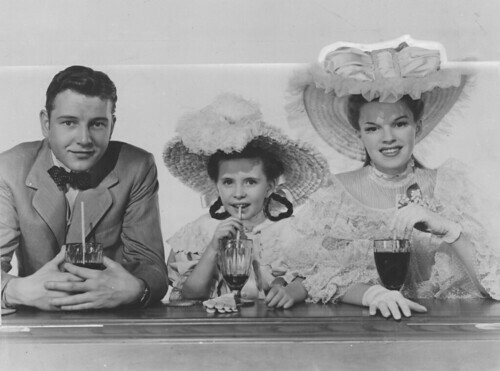 Tom Drake, Margaret O'Brien and Judy Garland in a publicity still for Meet Me in St. Louis (1944). Freed, Edens and Minnelli based their musical on a series of The New Yorker articles written by St. Louis native Sally Benson. Benson's charming vignettes were based on memories of her happy childhood growing up on 5135 Kensington Ave. around the time of the 1904 World's Fair (Benson herself was the inspiration for the youngest Smith sibling, Tootie, played by Margaret O'Brien). Judy Garland performs The Boy Next Door in Meet Me in St. Louis (1944). Originally, Freed only wanted to use period songs in Meet Me in St. Louis, but he changed his mind when songwriting team Blane and Martin landed at MGM. The songwriters already had a hit Broadway show under their belt (Best Foot Forward) when they were asked to write three new songs for Meet Me in St. Louis. Esther Smith (Judy Garland) and her boy next door (Tom Drake) in a publicity still for Meet Me in St. Louis (1944). The Boy Next Door is the first Blane and Martin song in Meet Me in St. Louis and it's designed as a showcase for Garland's formidable talent. The Boy Next Door reveals the inner thoughts and feelings of Esther Smith, an impressionable 16-year-old who is pining for her handsome next-door neighbor John Truett (Tom Drake). Blane and Martin based their songs very closely on Benson's articles, even using Benson's actual address for the ending of the first verse: "So it's clear to see/There's no hope for me/Though I live on 5135 Kensington Ave./And he lives on 5133." In fact, there was a boy next door on Kensington Avenue, although he was Tootie's childhood friend and he actually lived on 5137 Kensington (Blane and Martin changed the last number to make the lyrics rhyme). Tom Drake and Judy Garland on the set of Meet Me in St. Louis (1944). The Boy Next Door has continued to be a popular standard through the years. Everyone from Frank Sinatra, Barbra Steisand and Sarah Vaughan have recorded it and Vic Damone updated the song, re-titled The Girl Next Door, for the 1954 film Athena (clip below).